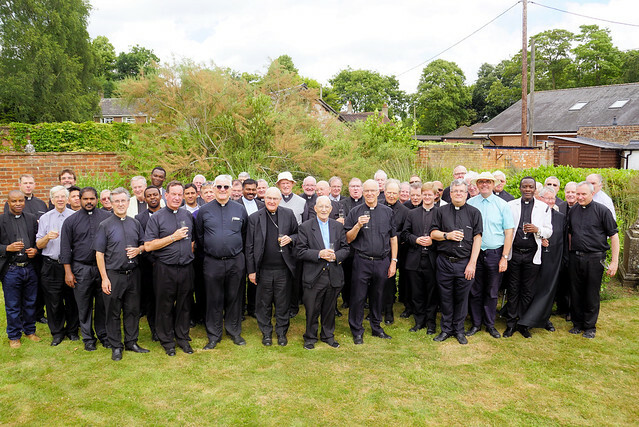 Three priests with a total of 150 years of service joined around 40 others from across the Diocese of East Anglia at a Celebration of Priesthood at the Bishop’s White House at Poringland earlier today (June 20). The priests came together to reflect on their ministry and to celebrate the years of faithful service given by those celebrating jubilees in 2018. Mass was concelebrated by Bishop Alan Hopes at the church of Our Lady of the Annunciation in Poringland. This was followed by drinks in the garden of the White House, courtesy of Bishop Alan, and then a buffet lunch. The priests celebrating special jubilees (pictured right with Bishop Alan) were, from the left, Fr Pat Cleary (40 years), Fr Michael Hazel (60 years) and Fr Charles Fitzgerald-Lombard (50 years). Also celebrating jubilees, but unable to be present, were Fr Neville McClement (60 years), Fr John Warrington (25 years) and Fr Bob Eccles (50 years). Bishop Alan also paid tribute to Fr Henry Whisenant and Fr Paul Maddison who are both leaving the diocese shortly to discern vocations with monastic communities. Click here or see below for a picture gallery of the celebration.